Alun Wyn Jones played for the British and Irish Lions team that beat South Africa 28-9 in the third Test in 2009. Alun Wyn Jones says Wales are "in a good place" as they prepare for World Cup year. 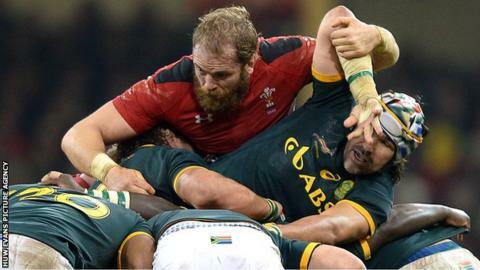 The Ospreys lock was part of a huge forward effort as Wales ended their autumn internationals with a 12-6 win over South Africa. But as their fans celebrated Wales' second ever win over the Springboks, Jones was more measured. "We finished on a positive but we can't let it paper over or let us forget the errors we need to work on," he said. "There's pats on the back behind closed doors, but we know there's a lot to work on. "There's going to be lots of rugby to be played whether it's domestic or international [before the 2015 World Cup] and I can't promise we're going to be any better, but we know where we are. "People will disagree and they're entitled to do that, but we're in a good place." The victory over South Africa came at the end of a month that saw Wales fall just short in the 33-28 defeat by Australia and concede three tries in the last 10 minutes of the 34-16 loss against New Zealand. But after a run of one win in 27 matches against the southern hemisphere's "big three", coach Warren Gatland admitted it was a win Wales "desperately needed". And Jones believes the timing of the victory was perfect for Wales after the "peaks and troughs" of Wales' autumn campaign. "I think I did an interview at the start [of the autumn series] and I said from my personal point of view - having experienced a World Cup in the past - that the World Cup year is the calendar year 2015. "From a rugby point of view this is the end of the start." Wales' next international is against England in the opening game of the Six Nations Championship in Cardiff on Friday, 6 February. They also face England in their pool of the 2015 World Cup, along with Australia, Fiji and Uruguay in September and October 2015.